The Buddhist Spirituality is the most rational movement of history, teaching the subject to become a superhuman or Awakened Being (Buddha) as a Way for the creation of a better world and a global peace. Therefore, the Way of Reconciliation (Maitriyana) is a refuge for all the oppressed peoples, without any discrimination of race, gender, religion or social class. The Free and Enlightened Being (Arhat-Bodhisattva) believes that it is really possible to reconstruct humanity starting from the values of Liberty, Equality and Fraternity. In this sense, the Buddhist Spirituality goes beyond the religious field, behaving as an ethical code of thought, word and action, while it promotes a rebellious conduct against tyranny both metaphysical and materialist. Siddhartha Gautama was the most important revolutionary of history because he preached a Discourse of Liberation and Self Determination of the peoples, performing a singular and enlightened contribution to the nine fields of psychology, pedagogy, medicine, philosophy, art, science, politics, sociology and religion. Therefore, the nine pathways of Maitriyana form a postmodern thought which overcomes the false dualism between East and West, being the prelude to a new era of Unity and Reconciliation of all humanity. Thus, when the spiritual master strives to achieve the Cure (Nirvana) of the world he is not having drastic ideas, but rather is allowing the emergence of the future in the here and now: the Middle Way of Salvation and Evolution. But to reach the Awakening (Bodhi) of peoples, the Free and Enlightened Being (Arhat-Bodhisattva) knows perfectly well that the evils of war, social injustice, illiteracy and pollution must be vanished. In this sense, since last 2600 years, the Buddhist Spirituality has been working deeply for the objective of World Peace, trying to build a Pure Earth or Kingdom of Righteousness in which welfare and serenity proliferates. This implies a society full of pacifism, redistributionism, advanced education and ecological harmony. This model of human rights communism is the embodiment of Peace within the people, revealing the spiritual nature that lies hidden in every human being, at the same time it is criticized the quest for power and material wealth for being a false path to happiness and progress in life. Although capitalism has become a global civilization, the Buddhist Spirituality hopes to guide the peoples towards the world peace by means of the Ethics of Detachment. By following Siddharta Gautama and other great Awakened Ones (Buddhas) that have appeared in different times and places, the Maitriyana seeks that all human beings attain genuine peace, by helping the poor and oppressed to find satisfaction and happiness in a simple and humble living. This compassionate wisdom (karuna -prajna) is focused on the practice of virtue, both in the inner world and the outer world. Definitely, according to the spiritual master, peace and altruism are the intrinsic nature of humanity. Consequently, the Buddhist Spirituality pursues objectives that are contrary to the governments, because the history of the world shows that the mundane power is opposed to Liberty, Equality and Fraternity of the people, constantly hindering balance and world peace that are the natural condition of the Earth (Gaia). In this way, the Free and Enlightened Being (Arhat-Bodhisattva) denounces governments as essentially selfish, consumerist and dualistic institutions. The Maitriyana establishes then that the world governments will become instruments of peace and justice when humanity is considered as one big family, always thinking about the interests of others. This is nothing less than the Cure (Nirvana) from greed, hatred and delusion, establishing the beginning of a new stage in the evolution of life, because in case of not assuming a spiritual transformation the peoples will be confronted to their self-destruction. Therefore, the Buddhist Spirituality is the One Way (Ekayana) to protect the rights of all individuals of planet, creating a Great Unity that encompasses all peoples and vanishing the repetition cycle (karma) of violence through a political, economic and cultural framework that works for peace, justice, human rights and true democracy. Only by confronting the differences and conflicts between nations through dialogue and international law is that the prehistoric and barbaric military forces will disappear. When war, injustice, ignorance and pollution are overcome, there will then be a society protected by global democracy and the universal human rights. 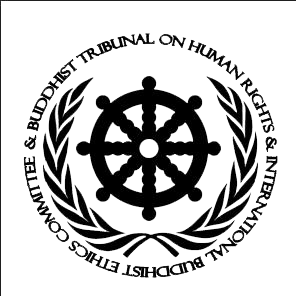 Only the Maitriyana seeks to create peace and justice throughout the world, by educating society and protecting the Earth (Gaia) through the Buddhist Spirituality and its Purpose (Dharma) to create a socialist civilization under the guidance of the values of Liberty, Equality and Fraternity for all the peoples.